(KDKA) SHANKSVILLE Stoney Creek Township is the kind of place where birds, not cars are the dominant sound in quiet moments. 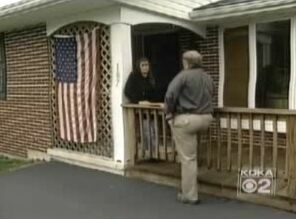 The peaceful nature of the town made the violence of Sept. 11 all the more painful for residents. “I heard a very loud roar of an engine and I just turned to look out my front window,” said Val McClatchey, an amateur photographer. “I immediately heard the plane you know, heard the engines screaming and just seconds later it hit,” said Rick King, of the Shanksville VFD. “The whole town shook, my porch rumbled - the ground just rumbled. King was on the first fire truck to leave Shanksville and the first to arrive at the scene. Four years later, King declines all interviews and has reduced his volunteer fire involvement. Shaffer who was another first responder and is no less effected. “It has never stopped since the plane crashed, there’s always something,” Shaffer said. He feels compelled by his position so he reluctantly accommodates reporters. “Sometimes it’s aggravating, when it interferes with your personal life then it’s aggravating,” Shaffer said. Shaffer says they’ve experience the best and worst in people since that day. McClatchey, who titled her picture “End of Serenity”, is getting a taste of the worst. “I’d like to see him - the coward that he is - set foot out here and lay claim to that,” McClatchey said. Recently a blog website has claimed McClatchey’s photo is a fraud. 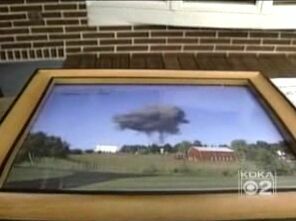 McClatchey still gives the proceeds from the picture to a foundation for Flight 93 families. The people of Shanksville, Lambertsville and Stoney Creek Township have learned that outside aggravations are part of being under a microscope. Note that the article doesn’t mention me by name, or link to my blogpost to get the whole story. More of my comments on this article here. except you don't explicitly say the photo is a fraud. You simply say that if the photo is legit, someone's got a lot of explainin' to do. Speaking of flight 93, I saw a commercial on Animal Planet today for the flight 93 memorial, and they had this woman who says she was Honor Wainio's sister. The young woman was attractive and wearing a very tight top and was VERY well endowed. Rather an impressive commercial; I wonder if they were doing some subliminal stuff there.